December 17, 2017—We all love to get out and enjoy ourselves in the outdoors, but we don’t always think about how to ensure that we get back home safe. Well, there’s an app for that! Just kidding, there isn’t really, but there is ham radio! My Off Road Radio (MORR) offers online ham radio classes and other mounds of information to help you get home safely. Their classes are specifically designed for the non-technically savvy. MORR simplifies the curriculum and uses anecdotal analogies that you, as someone who knows very little about electrical or radio theory, can and will understand. Everything you will need to get your Amateur Radio Technician License, and some of the more practical and applied uses of radios for the adventurist, gets covered. This helps ensure that you not only get your license, but that you can actually use it once you have it. And the great thing about MORR’s class is that you get to take it at your own pace, from your own home. With a ham radio technician license, you not only get crystal clear vehicle to vehicle communications (NO MORE CBs! YAY! ), but you also open up the world of repeaters. California alone has over 2,600 repeaters that will receive your signal and simultaneously retransmit it out at a much higher power, from higher elevation. It is not uncommon to hear a repeater signal from upwards of 300 miles away. Think of how many people you can reach within 300 miles when you get stranded in the desert. One of the best things about My Off Road Radio and our partnership with them is that when you take one of their online classes, you have the option of giving back 15% of your class registration to SDORC. 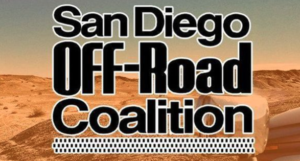 This helps support all of the great lobbying and support that SDORC does for the off road community. So, when you sign up for your online ham radio class, choose SDORC as your affiliate! Along with ham radio classes, My Off Road Radio also offer over-the-Internet radio programming, a series of blogs, 4×4 trail locations, hiking trail locations, community forums, and a shop where you can find all of the equipment that is reviewed in their blogs. Stop by and start studying for your Ham Radio Technician License today!